A sure sign of new springtime growth is guttation. 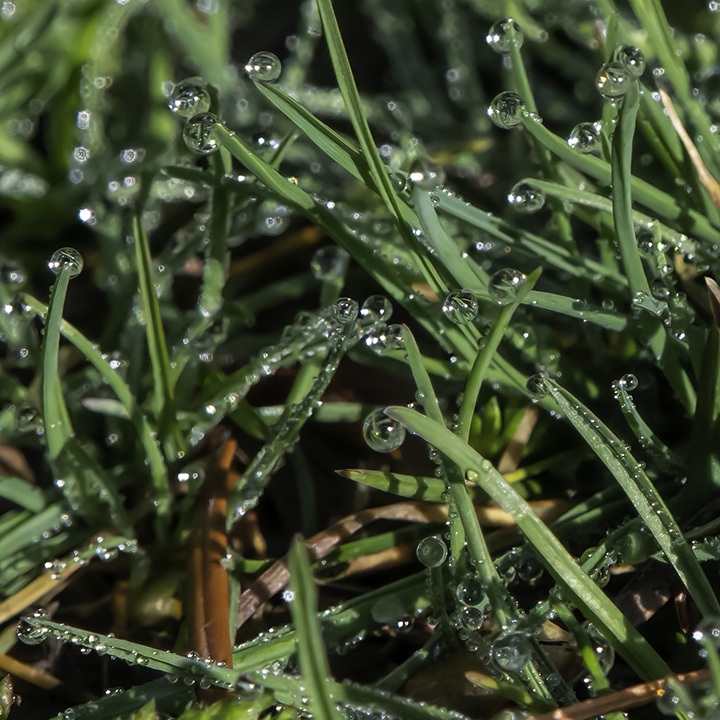 The water drops on the grass in the morning might have been casually dismissed as being dew. Not so, they are guttation. OK, there was also some dew on the grass, but what caught the eye were the large drops of guttation. The significant thing is that dew can form on any solid object; Guttation can only form on vegetation that has been transpiring. When water vapour (mixed in the air) is cooled by contact with a cold surface, it condenses as liquid droplets on the surface. While that surface could be living (such as a leaf), it could just as easily be a rock or sand on a beach. In the picture below, the dew is the tiny droplets that lie along the blades of grass, not the large drops at the tips of the blades. Guttation (from Latin, gutta, meaning drop) is water that has been pumped up from moist soil and through the plant, rather than water that has been deposited directly from the atmosphere onto the leaf, as dew has. When roots are warm and moist, they pump moisture and nutrients to the rest of the plant. That moisture is then transpired through the stomata on the leaves. However, during the low temperatures of night, the stomata close. When the stomata are closed for the night, do the roots know that there is now no point in continuing to pump? No, they don’t. Grass is not very smart: if roots are still warm and moist, they pump. The result is that the moisture is extruded from the tip of the blade where it forms a large drop. This is the guttation. Clearly, the appearance of guttation indicates a non-dormant plant — one that is growing. Large drops of guttation on the tips of these grass blades indicates that the grass is now growing — it is springtime. This entry was posted in weather, wildflowers. Bookmark the permalink. Very interesting…thanks for this photo, observation and explanation..
“Grass is not very smart: if roots are still warm and moist, they pump.” Well, then, my general intuitions are confirmed. I am very attracted to dumb things. Certainly, wisdom is not smart. Thank heavens. I value courage and imagination over intelligence. Any day of the week. ALWAYS something to learn from you, Alistair…the new word for my day: guttation…I’ve seen it, now I’ll know what to call it! Thanks Alistair! Thanks for elucidating another of many of nature’s mysteries! Holy beautiful guttation. I would like to have it on my wall always. It would be, for me, the apotheosis of informed eyes. Pamella (Q) always has just the right comments, and is always as thoughtful in seeing. I enjoy you both so much…and I know one or two people who are as smart as grass!